Moderating a panel discussion an ICMA Covered Bond Investor Council and The Covered Bond Report conference last Thursday (1 June), Peter Munro (pictured speaking) – director, market practice and regulatory policy, ICMA – cited the potential for growth in the green and social covered bond markets. He noted that the wider green bond market has set an example, with issuance having doubled to over Eu80bn last year. However, just one green covered bond has been issued to date, alongside a handful of social or sustainable covered bonds. 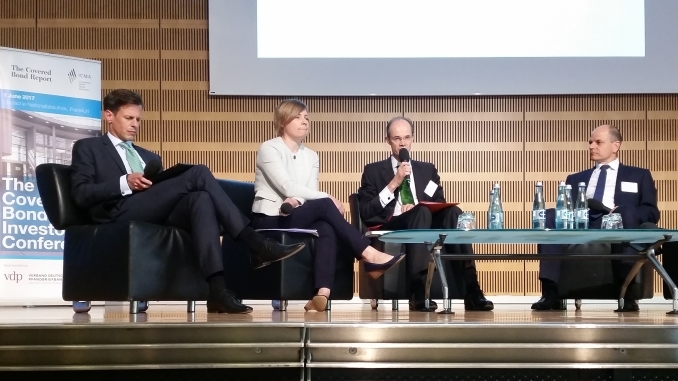 Florian Sommer, senior strategist, head of sustainability research, Union Investment Privatfonds, said green bonds are well-liked as they offer environmental and transparency benefits while trading in line with traditional bonds of the same issuer. Sommer suggested the wider green bond market could be entering a new phase, with more and more managers setting up dedicated green bond funds. Union Investment currently manages Eu25bn in dedicated sustainable assets, out of around Eu300bn assets under management in total, noted Sommer. He added that it launched a dedicated green bond fund in April and has to date invested around Eu1bn across all their products and mandates. However, he acknowledged that the green covered bond market has made a slow start. Berlin Hyp is currently on the road marketing its second green Pfandbrief, which is expected to be launched next week. 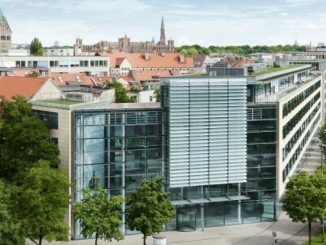 The deal will be a follow-up to the first and only green covered bond benchmark, which Berlin Hyp sold in April 2015, and from the same programme off which it issued a debut green senior unsecured deal in September. Bodo Winkler, head of investor relations and sales at Berlin Hyp, said the work required to prepare green issuance and a lack of data on potential collateral partly explains why supply has been limited so far. Jennifer Johnson, head of legal and economic affairs at the European Mortgage Federation-European Covered Bond Council (EMF-ECBC), echoed this, stating that the lack of data and standardised definitions and reporting requirements are a major hindrance to market participants in their assessments and due diligence. She noted that the EMF-ECBC is working on an application for EU funding for a project assisting in the collection of technical and financial data relating to energy efficient mortgages. 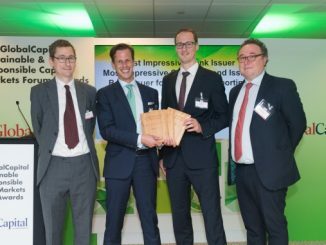 The EMF-ECBC has already won EU funding for the Energy Efficient Mortgage Initiative, which aims to incentivise borrowers to improve the energy efficiency of their property, with the ultimate objective of establishing a framework for a standardised Energy Efficient Mortgage product. Johnson said the EMF-ECBC will be designing and delivering that project over the next 24 months, and noted that the organisation is also working to introduce a Green covered bond label. Berlin Hyp’s Winkler said another factor holding back the expansion of the market is that issuers do not yet achieve tighter pricing through green covered bonds versus conventional covered bonds, as spreads are compressed under the influence of the ECB’s covered bond purchase programme. “It has to be your belief that you are doing the right thing, rather than achieving some monetary privileges,” he said. 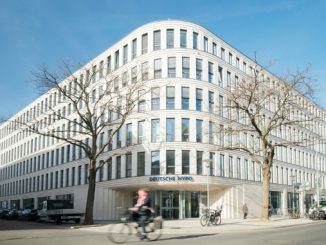 However, Winkler said green covered bonds offer issuers an opportunity to broaden their investor base, noting that Berlin Hyp has already reached many new accounts by launching its green issues. He and Sommer agreed that a spread differentiation could emerge between green and traditional covered bonds after the ECB exits QE, and said this could encourage the growth of the market. Munro closed the panel by asking what role each panellist’s organisation would play in the development of the green market and what would further encourage its growth. 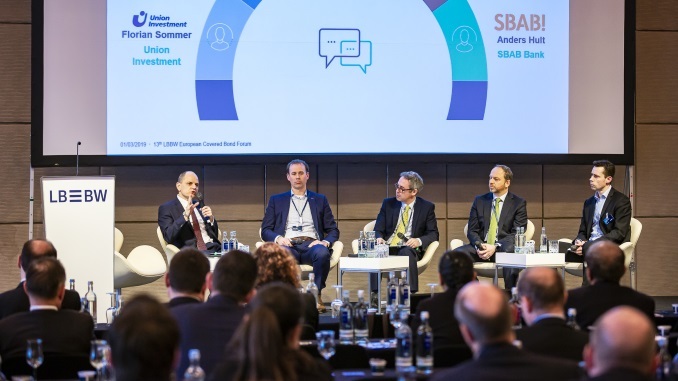 Sommer said that, having established its new green bond fund, Union Investment must now convince its clients to put their assets into such dedicated funds, noting that in Germany, many smaller or medium-sized institutional clients, for example, are still unfamiliar with the product. Winkler said Berlin Hyp would continue to be a regular issuer of green covered bonds and senior unsecured bonds. “This will definitely not the be the last one,” he said. 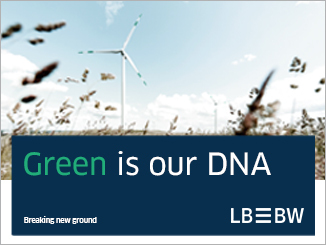 “We have a very ambitious goal in place, to reach 20% green loans versus our overall loan portfolio by 2020. Winkler added that the green bond market does not yet require extensive regulation and standardisation. “There is a lot of creativity in the green bond market, and I think we are still at such an early stage, where creativity can let itself develop,” he said. “Then, at a later stage, it will of course be necessary to somehow define more what a green bond is. Johnson shared this positivity, noting ambitious EU climate targets and the scale of investment going into achieving them.